AudioLabel CD/DVD Labeler is smart cd label software that helps you create and print cd covers, jewel case inserts, and DVD case labels. Our cd label maker has been specifically designed for the audio enthusiast. It can automatically find your album information and fill out the label for you. Easily add your own images, art work, or photos using the integrated thumbnail viewer. It includes a cool art gallery and also has an image search function that can scan your computer for thousands of images. 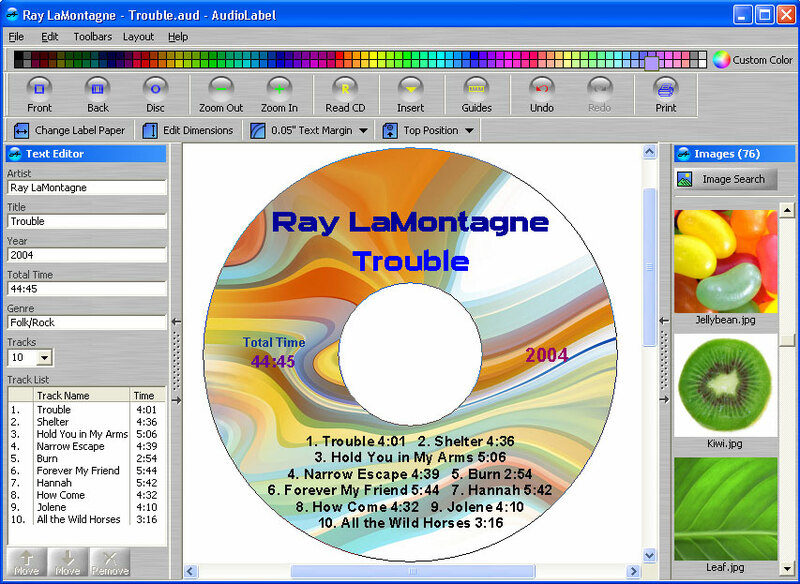 Album information can be retrieved from the Freedb internet database, CD-Text and CDPlayer.ini file. Our cd label creator can even read and label your MP3 CDs using the ID3 tag and filename. Actually works rather nicely. My problem w/ the idea of labels on CD-Rs in general is that most "slot loading" player recommend not using them, cuz if they get warm & curl up(which they seem to do all to often for me), they come off inside the deck & then you are hosed. Not the fault of this app of course, but definitely somthing to consider. Still for what it does, it works. GUI is easy to use & understand, some of the disc templates look good.